After his band Shockabilly broke up Eugene Chadbourne was slightly soured by the experience of playing in a trio, and pursued his solo career only electing to work with other bands in sporadic fashion, recording albums of songs where he would be backed up by a band whose music he liked. In this manner he recorded with various eccentric and underground US bands – Sun City Girls, Violent Femmes, Camper Van Beethoven, and Evan Johns and The H-Bombs. 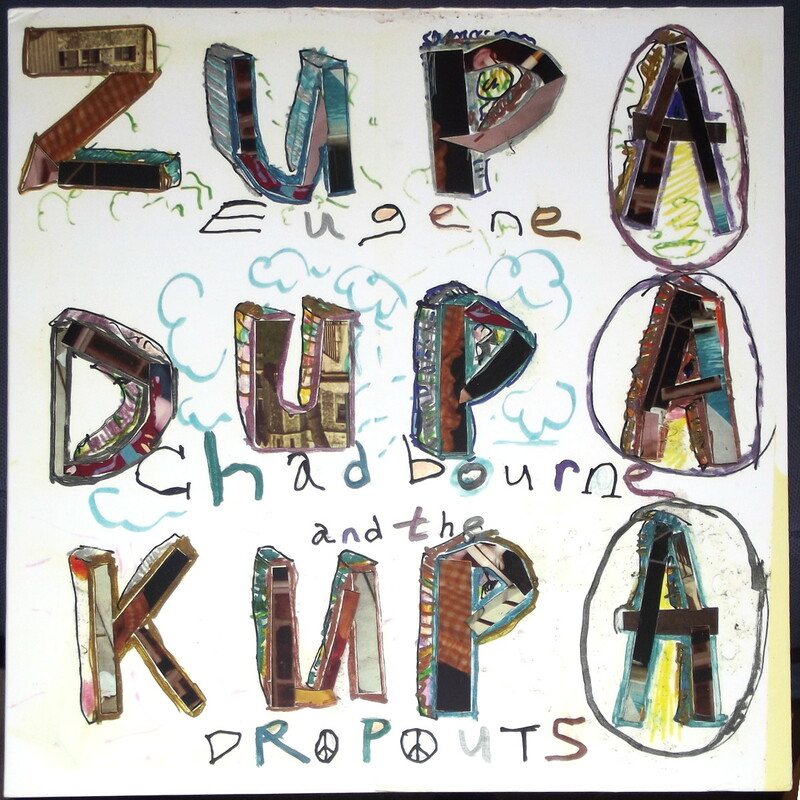 This tradition perhaps continues on his new LP Zupa Dupa Kupa (MONOTYPE RECORDS MONOLP007) with The Dropouts, a team of rampant madmen with wacky aliases who spurt out the sort of messy and enthused rock mayhem which frames his songs so admirably. On the more unhinged songs like ‘Forgiven’ and ‘Hendrix Buried In Tacoma’, everyone is clearly in their element and glorious chaos set to a primal beat is the sweaty result. 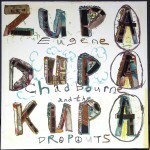 Chadbourne also exhibits his familiarity with multiple musical styles, bringing in the familiar elements and stylistic plunderings from C&W, bluegrass, rockabilly and jazz (often within the same song) to flavour up the broth. The album begins and ends with two folky banjo and vocal solo spots which are quite touching, with their poignant lyrics, but also unsettling with their dotty images. Which seems a good moment to mention the lyrical content. Chadbourne has always admired the honesty and political integrity of Phil Ochs, and since the 1980s he has yawped out barbed political satire in the form of zany and frantic songs. Natch, he had a field day under the Reagan and Bush administrations, and on the present LP he even revives his old song ‘Sword & Shield’ from that period (it was a swipe at the Strategic Defense Initiative). But the events of the last ten years have given him plenty of ammunition for this album, and while he continues to fire his darts at the usual targets such as the White House or the industrial-military complex, there’s also a few digs at the iniquities of the financial ruin that has been ravaging the world since the banking and mortgage scandals brought about collapse on a global scale. In ‘Bird Song’ he likens society’s modern enemies to various sorts of unpleasant avians – greedy, hypocritical, and scavenging, and identifies many new virulent strains of evil yuppies. These creatures walk among us, Chadders warns us, and they are evolving in cunning ways. Then there’s ‘Pod’, which is the best song on the album, finding a brilliant metaphor for the ways in which we all try to cushion ourselves from reality these days, expanding the comfort zone until we never have to deal with anything difficult again, whether it’s by hiding from society on Facebook or shutting out the ugly noise of humanity through our iPod earplugs. Or by making silly amounts of money through casino banking, more than a human being could possibly spend in ten lifetimes. No-one in society is safe from Chadbourne’s barbs on ‘Pod’ as he raps out his shopping-list in the manner of a young Bob Dylan, and the church and the politicians are the first to be lined up in the sights of his airgun. Plus there are other comical songs which verge on the surreal with their baffling themes, especially ‘The Dentist’ and ‘The Devil on the Radio’, a demented horror-movie song about CB radio sung in his spoof Nashville style. Not only that but we have Chadbourne’s madcap singing voice which is still as cracked as ever, injecting additional laughing gas into the stream of events. And if you just like super-fast guitar runs packed with reverb and oomph then the Euge zips through the history of American guitar-picking like a hot rodder zonked on acid and bourbon, though I must admit I stole that last metaphor from an old NME review. It often gets overlooked in the steamy excitement of his jumbled records, but Dr Chadbourne can read sheet music and has transcribed complex be-bop jazz solos into scores for the guitar. He’d have been a session player deluxe in the 1960s, the cream of the Wrecking Crew. Lastly there is the sleeve’s anarchic cover art featuring his collage and doodles technique which has stood him in good stead for about 30 years. The last bit of the mystery is why this wackeroo got released on the Polish art label Monotype Rec. Maybe they, or someone, needs to start reissuing his old cassette tapes from the 1980s, buy kamagra us which were quite numerous and apparently notorious for their terrible sound quality. Who could resist? Now for something from Winds Measure Recordings. There’s an art label if ever there was. Though I start out daunted by their blank covers and severe process-based art music, I always end up loving all of their ultra-minimal releases without really understanding why. For some reason they often make me feel like I’m trapped in the snow, or make me want to reach for snow-related metaphors from my big book of writing techniques. It so happens that today is pretty snowy in London, as I write. It might be the way that any given WMR release sounds like radio waves emitting from a tiny shack in the middle of an Arctic waste. Or that one of their obscure sonic scientists has attempted to document the sound of a snowflake falling, for reasons that remain obscure. Or they have somehow turned the microscopic crystalline form of a snowflake into data which we can hear replayed over an advanced form of media player. Well, I’m certainly in my element with this new vinyl LP (WINDS MEASURE RECORDINGS 25) from the label. They have done vinyl singles but this might be their first 12 inch LP. It’s pressed in white vinyl, the colour of snow. It’s a split between Will Montgomery, who is actually a snowman, and Robert Curgenven, who once saw a picture of some snow on a field in an art gallery. The side by “Monty” is pretty compelling, an industrial vision from South London using a radio receiver and a coiled piece of wire acting like a spirit-communication telephone device. He calls it ‘Heygate’. The whole thing might be a clever combination of radio waves and field recordings. I have the sense of machinery failing to function, but failing on a grand scale, like a large-scale refrigerator unit going wrong in a large meat-packing plant and causing all the sides of beef to spoil. There are also episodic bursts of static noise which are quite good. They are liked failed distress messages from the lonely radio, a device which warms up and then cools down again as the skipper tries another frequency, then turns it off in disgust. And some other events too which can’t really be described. Now and again “Monters” manages to tune or detune his solid feedback hums into a sound which could almost be identified as a root chord, which is counterbalanced by another chord, but then the music which is almost forming is bent back to the main path, which is the generation of pure sound and abstraction. If there was editing going on here, he’s been ingenious at concealing his steps. But that’s the way snowmen work. Robert Curgenven made Silent Landscapes in 2008 using field recordings from Australia. His side is I suppose slightly more musical than the flip, to the extent that a very sweet and dreamlike electronic drone persists through most of its 20 minutes. It vacillates a little, and may not actually rest on a single note, but it has vibratory powers that can soothe away the headache from a grumpy old sea-lion. The quality of this tone is also incredibly pure. It has the clean signal that most radio engineers and studio producers have spent their entire careers trying to replicate. As Curgenven’s ‘Looking for Narratives On Small Islands’ continues its floaty and drifty voyage through space and time, hovering above the earth like a time travel bubble, then other textures and field recordings pass by the barometer and scanning units, building up a minimalist frieze of events which is inscribed on the vinyl canvas. You notice how the word “frieze” sounds like “freeze”. That is completely intentional and convinces me this music will make a perfect accompaniment to a walk in the park next to my frozen pond. This is a crackly, crunchy and tone floating masterpiece of slowness and stillness produced by superficially non-artistic, process-heavy means. It’s something to do with guitar feedback, binaural microphones, field recordings from around the world, and industrial fans. And something called the transparence dubplate. Maybe it’s this engine that produces the stuck-record effect, the crackle of old vinyl which bubbles in now and again. As ever with this label, a very thoughtful presentation in the design, an all-white letterpress cover with odd abstract shapes embossed in blind, plus obi and insert. A great one from March 2012.